Ice cream can come in an assortment of flavors, but the underlying chemistry is largely the same. Courtesy of Ashley’s Ice Cream. Ice cream is a significant presence in American culture, as over 1.53 billion gallons were produced in the U.S. alone in 2011. Yet the confection does more than merely fill our stomachs – it also occupies the minds of scientists through its unique chemistry. Combining the typical ingredients for ice cream — heavy cream, milk, sugar, and vanilla — yields a mixture in which all three states of matter — solid, liquid, and gas — coexist. The final product consists of small air bubbles representing up to fifty percent of the mixture by volume, globules of fat derived from milk, and ice crystals. In order to yield ice crystals, the mixture must be cooled to a temperature lower than the freezing point of water. If the mixture is frozen quickly, small crystals will form that give ice cream its creamy consistency. Ice cream exists simultaneously as a solid (the ice crystals), a liquid (the milk and sugar solution), and a gas (the air bubbles), adding to its unique properties. Courtesy of Ice Cream Nation. The temperature of liquid nitrogen is minus 320 degrees Fahrenheit, which is roughly the same as the average temperature on Neptune. Hence, this element is significantly cold enough to use for the purposes of concocting ice cream, though it is not the conventional means of doing so. One must simply pour the liquid nitrogen into the mixing bowl with the other ingredients and stir until the mixture has thickened. As liquid nitrogen can be dangerous, it must completely boil off before the ice cream can be served. In lieu of liquid nitrogen, a salt and ice mixture can act as the freezing agent in small batches. This substance acts as a super-cold liquid that can lower the freezing point of a mixture in order for a liquid phase to be present at temperatures that would otherwise yield the solid phase — a phenomenon known as freezing point depression. Commercially, an ice cream freezer is utilized to cool the concoction. More complex machines are equipped with a pump so that the ice cream can be produced continuously. 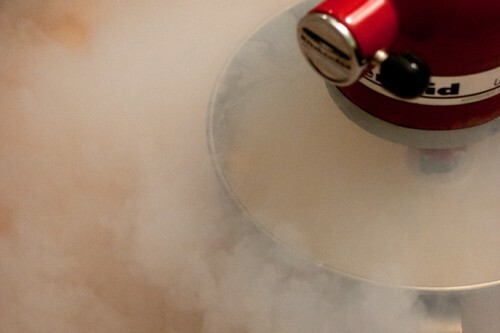 Liquid nitrogen can be used as one mode of cooling the ice cream mixture to allow for ice crystal formation. Courtesy of 101 Cookbooks. Ainissa Ramirez, a former Associate Professor of Mechanical Engineering and Materials Science at Yale, suggests that ice cream may have properties that can be used to model and analyze natural phenomenon. For instance, if ice cream melts and refreezes, its ice crystals grow larger. Ice crystals play an important role in avalanche formation, as a variance in crystal size promotes instability. As such, one focus of Ramirez’s research is predicting the microstructure of crystals. About the Author: Amanda Buckingham is a freshman prospective Molecular Biochemistry & Biophysics major in Berkeley College. She is also a contributing reporter to the Yale Daily News.